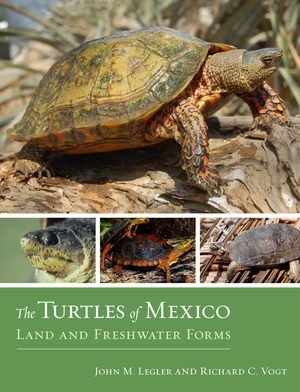 The Turtles of Mexico is the first comprehensive guide to the biology, ecology, evolution, and distribution of more than fifty freshwater and terrestrial turtle taxa found in Mexico. Legler and Vogt draw on more than fifty years of fieldwork to elucidate the natural history of these species. The volume includes an extensive introduction to turtle anatomy, taxonomy, phylogeny, biogeography, and physiology. A key to the turtles of Mexico is included along with individual species accounts featuring geographic distribution maps and detailed color illustrations. Specific topics discussed for each species include habitat, diet, feeding behavior, reproduction, predators, parasites, growth and ontogeny, sexual dimorphism, growth rings, economic use, conservation, legal protection, and taxonomic studies. This book is a complete reference for scientists, conservationists, and professional and amateur enthusiasts who wish to study Mexican turtles. John M. Legler is Professor Emeritus of Biology at The University of Utah, Salt Lake City. Richard C. Vogt is a researcher at the National Institute for Amazonia Research, in Manaus, Brazil.